You can tell a lot about the general health of your cat by the condition of his skin. If you are concerned about your pet’s welfare you should seek advice from a veterinary expert, they can take a good look at your cat, diagnose the problem and provide suitable treatment. Skin disorders are relatively common in cats, but they are unpleasant and can cause your kitty discomfort. If your cat seems to be scratching more than normal, chewing at their fur or licking themselves excessively you could have a problem on your hands. There are many causes, your furry baby might have nasty parasites biting at his skin, or be suffering from an allergy, or some sort of infection. Whatever the problem it’s important to get to the bottom of what’s causing your cats skin problems in order to get the best treatment, after all doesn’t your pampered puss deserve the very best care you can provide? Allow us to take you on a whistle-stop tour of some of the most common skin ailments that affect our feline friends. 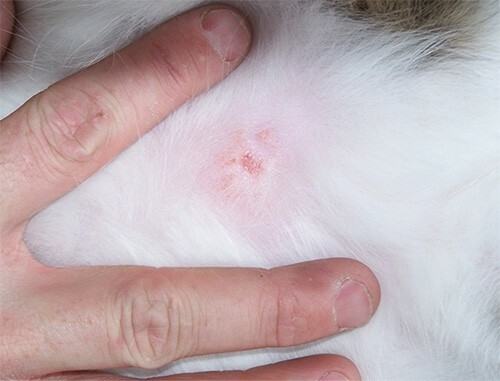 Bites and puncture wounds can cause discomfort to your cat, you might notice a swelling that starts off quite solid and then goes softer, this is an abscess. The abscess may start to weep and ooze pus. It’s important to keep the area around the abscess and clean and if it doesn’t heal quickly, seek help from your friendly vet. Cats can actually suffer from acne too! Or comedones as the condition is more formally known. The spots tend to appear around the lips and under the chin. Sometimes they are caused by irritation associated with certain materials e.g. your cat may experience a reaction to his plastic water dish. The condition can be treated with specialist gels and shampoos to ease irritation and providing your cat with additional Omega-3 fatty acids may help, but as always, it’s best to seek advice from the experts in terms of treatment. Cats can contract contact dermatitis, which can cause scratchy little bumps and irritated skin. Just like humans, some cats suffer when they come into contact with certain chemicals or irritants. If this is the case, keep your feline away from any chemicals that are being used. 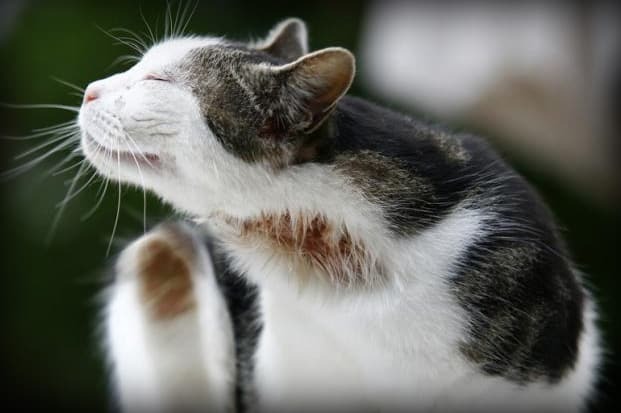 You should also check if the dermatitis is being caused by a reaction to a material your cat comes into contact with e.g. a plastic food bowl. If it looks like this is a problem you will need to invest in bowls made from something else, such as stainless steel. Ear mites can cause your moggy real discomfort. If your cat is suffering from this problem you will notice that he will shake his head and scratch at his ears. If you can get close enough take a look check to see if the ears look particularly waxy (full of brown goo), this is a sure-fire sign of a problem. It’s important to eradicate the ear mites as soon as possible (special ear-drops usually do the trick), if not treated, your cat could end up with a nasty ear infection. 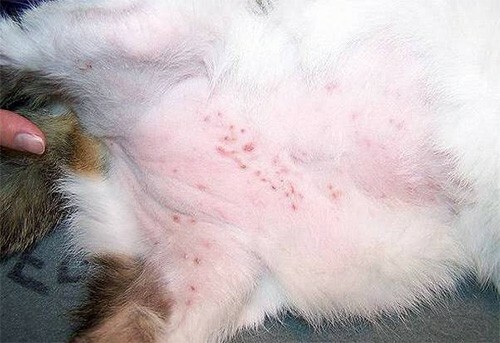 Allergies can be a very real problem for cats, if you notice little bumps on your cats back, inner thighs, back legs and tail it could be that your cat has had a few unwanted visitors in the form of fleas. Not all cats react badly to fleas, but for some flea allergy dermatitis can cause lots of discomfort. Flea control is essential to keep your cat free from pests. Food can also bring on an allergic reaction in some cats. There may be an ingredient that does not agree with your feline, in which case he will experience uncomfortable itching and his eyelids might also swell up. If your cat scratches himself too hard he will damage his skin, leading to sore skin and possible loss of hair. Steroid injections are usually offered to ease any discomfort, but the long-term answer lies in identifying the cause of the irritation and removing it from your cat’s life. Cats can also suffer from a condition known as psychogenic alopecia which relates to the fur becoming thinner. This is usually due to a cat excessively grooming itself (which is often the result of a kitty feeling overly stressed). It’s important to try and help your cat by offering a calm space where they can feel content and secure. Play with your furry friend to help them get rid of some of that nervous tension. Medication is available, but is generally only prescribed for very serious conditions. This is a yucky one, and its caused when the glands produce too much oil. If you regularly find oily, brown matter caked around the top of the tail (which smells foul), then your kitty could be suffering from stud-tail. This condition is usually related to tom cats that have not been neutered, but it’s not unheard of for other cats to suffer from this ailment too. Ringworm spreads exceptionally easily and is a disease that can affect humans as well as animals. This fungal infection can cause circular patches – hair will be lost in the center and a ring of red usually appears around the boundary of the circle. It’s essential to get ringworm treated as soon as possible and your vet will be able to prescribe medication to help. You will need to don your rubber gloves and give your home a good clean too, just to be sure you have eradicated all traces of this highly contagious condition. It doesn’t seem overly likely that a cat can catch sunburn, but not all cats benefit from a protective fur coat. The Sphynx and cats like it do not have the luxury of cat hair to protect themselves. Therefore, it’s important that hairless cats refrain from getting sunburnt by staying out of the hot midday sun. Too much sun can also lead to problems such as skin cancer. Your cat has yeast in his ears, nose, mouth and genitalia (which is perfectly normal), problems arise if your cat becomes poorly and his immune system becomes weaker. This can result in a yeast infection, which is an uncomfortable condition for your kitty cat to put up with. There are creams available that will help ease any soreness. Both feline immunodeficiency virus (FIV) and feline leukaemia virus (FELV) are viruses that lead to your cat experiencing a weakened immune system. As they are less able to fight off illness you cat may start to suffer from health issues, including skin problems. Both FIV and FELV are debilitating conditions and if you think your cat has either you should head straight to the vet for confirmation and treatment. Treatment will help to clear up any skin issues your cat may be suffering from, but to prevent reoccurrences it’s a good idea to put some pre-emptive measures in place. Make sure you guard against fleas and worm your cat at regular intervals as suggested. Provide a balanced and nutritional diet for your cat to keep him in tip-top condition and look after your feline’s mental well-being too. A happy cat will be less-stressed and less likely to suffer from anxiety related illnesses such as some skin conditions. Having your cat neutered can also help, fighting can have a negative impact on your tom-cat, a neutered cat is less likely to want to take on the world!